Today, the Wyoming State Quarter Coin remembers the beginning of Powell’s second expedition down the Colorado River 144 years ago. In the book, A Canyon Voyage, The Narrative of the Second Powell Expedition Down the Green-Colorado River from Wyoming, and the Explorations on Land, in the Years 1871 and 1872, published in 1908, – Frederick Samuel Dellenbaugh wrote of his journey with John Wesley Powell. The 22d of May, 1871, gave us a brilliant sun and a sky of sapphire with a sparkling atmosphere characteristic of the Rocky Mountain Region. The great buttes near the station, which Moran has since made famous, shone with a splendor that was inspiring. To enable us to pick up the last ends more easily and to make our departure in general more convenient, we had breakfast that morning at Field’s outfitting place, and an excellent breakfast it was. It was further distinguished by being the last meal that we should eat at a table for many a month. We were followed to the cove, where our loaded boats were moored, by a number of people; about the whole population in fact, and that did not make a crowd. None of the Chinamen came down, and there were no Indians in town that day. The only unpleasant circumstance was the persistent repetition by a deaf-mute of a pantomimic representation of the disaster that he believed was to overwhelm us. ” Dummy,” as we called him, showed us that we would be upset, and, unable to scale the cliffs, would surely all be drowned. This picture, as vividly presented as possible, seemed to give him and his brother great satisfaction. We laughed at his prophecy, but his efforts to talk were distressing. It may be said in excuse for him, that in some paddling up the river from that point, he had arrived at perhaps an honest conviction of what would happen to anyone going below; and also, that other wise men of the town predicted that we would never see ” Brown’s Hole,” at the end of Red Canyon. At ten o’clock we pushed out into the current. There were “Good-bye and God-speed” from the shore with a cheer, and we responded with three and then we passed out of sight. The settlement, the railway, the people, were gone ; the magnificent wilderness was ours. We swept down with a four-mile current between rather low banks, using the oars mainly for guidance, and meeting no difficulty worse than a shoal, on which the boats all grounded for a few moments, and the breaking of his oar by Jones who steered our boat. About noon having run three miles, a landing was made on a broad gravelly island, to enable Andy to concoct a dinner. A heavy gale was tearing fiercely across the bleak spot. The sand flew in stinging clouds, but we got a fire started and then it burned like a furnace. Andy made another sample of his biscuits, this time liberally incorporated with sand, and he fried some bacon. The sand mainly settled to the bottom of the frying pan, for this bacon was no fancy breakfast table variety but was clear fat three or four inches thick. But how good it was! And the grease poured on bread! And yet while at the rail way I had scorned it; in fact I had even declared that I would never touch it, whereat the others only smiled a grim and confident smile. And now, at the first noon camp, I was ready to pronounce it one of the greatest delicacies I had ever tasted! They jeered at me, but their jeers were kind, friendly jeers, and I recall them with pleasure. In warm-hearted companionship no set of men that I have ever since been associated with has been superior to these fellow voyageurs, and the Major’s big way of treating things has been a lesson all my life. We had all become fast true friends at once. With the exception of the Major, whom I had first met about two months before, and Frank whom I had known for a year or two, I had been acquainted with them only since we had met on the train on the way out. In the scant shelter of some greasewood bushes we devoured the repast which the morning’s exercise and the crisp air had made so welcome, and each drank several cups of tea dipped from the camp-kettle wherein Andy had boiled it. We had no formal table. When all was ready, the magic words, “Well go fur it, boys,” which Andy uttered stepping back from the fire were ceremony enough. Each man took a tin plate and a cup and served himself, Clem and Frank were sent back overland to the town for a box of thermometers forgotten and for an extra steering oar left behind, and the Canonita waited for their return. During the afternoon, as we glided on, the hills began to close in upon us, and occasionally the river would cut into one making a high precipitous wall, a forerunner of the character of the river banks below. The order of going was, our boat, the Emma Dean, first, with Major Powell on the deck of the middle cabin, or compartment, sitting in his arm-chair, which was securely fastened there, but was easily removable. S. V. Jones was at the steering oar, Jack Hillers pulled his pair of oars in the after standing-room, while I was at the bow oars. The second in line was the Nellie Powell, Professor A. H. Thompson steering, J. F. Steward rowing aft, Captain F. M. Bishop forward, and Frank Richardson sitting rather uncomfortably on the middle deck. The third and last boat was the Canonita, which E. O. Beaman, the photographer steered, while Andrew Hattan, rowed aft, and Clement Powell, assistant photographer, forward. This order was preserved, with a few exceptions, throughout the first season’s work. It was the duty of Prof, and Jones to make a traverse (or meander) of the river as we descended. They were to sight ahead at each bend with prismatic compasses and make estimates of the length of each sight, height of walls, width of stream, etc., and Cap was to put the results on paper. The Major on his first boat, kept a general lookout and gave commands according to circumstances. He remembered the general character of the river from his former descent, but he had to be on the qui-vive as to details. Besides every stage of water makes a change in the nature of the river at every point. In addition to this outlook, the Major kept an eye on the geology, as he was chief geologist; and Steward, being assistant geologist did the same. Richardson was assistant to Steward. Jack was general assistant and afterwards photographer. I was artist, and later, assistant topographer also. It was my duty to make any sketch that the geologists might want, and of course, as in the case of everybody, to help in the navigation or anything else that came along. Each man had a rifle and some had also revolvers. Most of the rifles were Winchesters. We had plenty of ammunition, and the rifles were generally kept where we could get at them quickly. In this order, and with; these duties, we ran on down the Green, and so far at least as I was concerned, feeling as if we had suddenly stepped off into another world. Late in the afternoon we were astonished to discover a solitary old man sitting on the right bank fishing. Who he was we did not know but we gave him a cheer as we dashed by and were carried beyond his surprised vision. As the sun began to reach the horizon a lookout was kept for a good place for camp. I, for one, was deeply interested, as I had never yet slept in the open. At length we reached a spot where the hills were some distance back on the right leaving quite a bottom where there were a number of cottonwood trees. A deserted log cabin silently invited us to land and, as this was cordial for the wilderness, we responded in the affirmative. The sky had a look of storm about it and I was glad of even this excuse for a roof, though the cabin was too small to shelter our whole party, except standing up, and the beds were all put down on the ground outside. 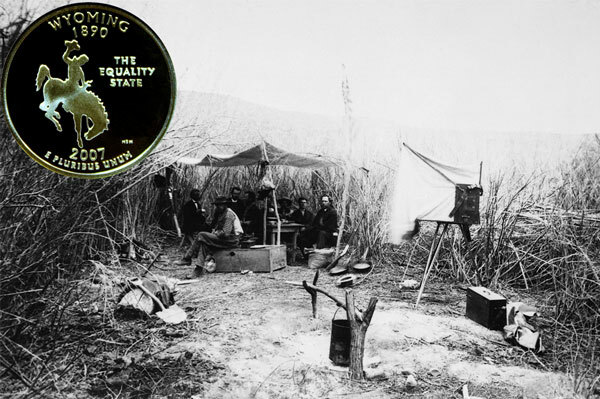 The Wyoming State Quarter Coin shows against an image of the expedition’s first camp near Green River, Wyoming.